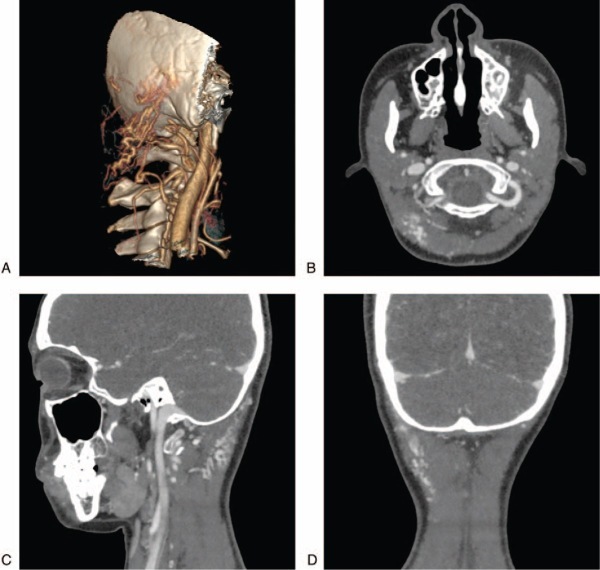 The patient, a 31-year-old woman, was admitted to the department of neurosurgery at The First Hospital of Jilin University due to a “right occipital mass for 5 months”. The patient was in good health, and her family members did not have similar lesions. A physical examination showed that the mass was in the right occipital region at the upper margin of the sternocleidomastoid muscle and exhibited slight tenderness without obvious pulsation or vascular murmurs during auscultation. A head CTA examination at admission suggested that the lesion was approximately 3 × 5 cm in size, was mainly composed of vascular components, presented as a “wool mass”, was located in a subcutaneous region, involved the muscles, and showed obvious enhancement. The lesion was mainly supplied by the occipital and muscular branches of the vertebral arteries. 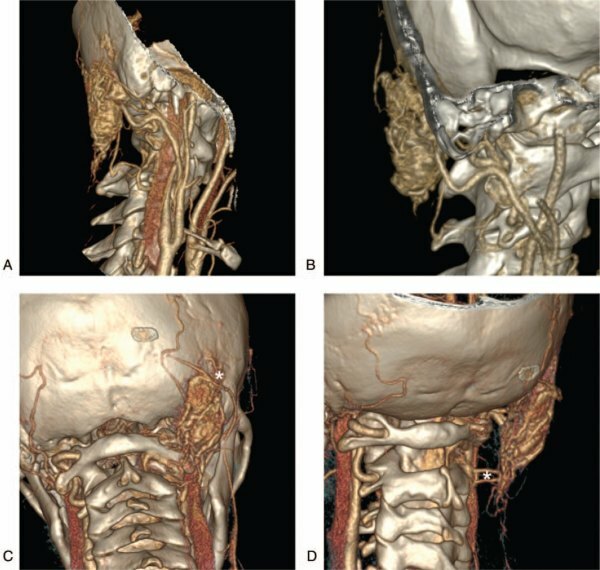 The venous drainage of lesion communicated with the suboccipital venous plexus and the paravertebral venous plexus, and the venous drainage communicated with the subcutaneous cervical superficial veins. A further DSA examination revealed that the blood supply of the lesion was mainly from the occipital artery and less from the muscle branches of the vertebral arteries. 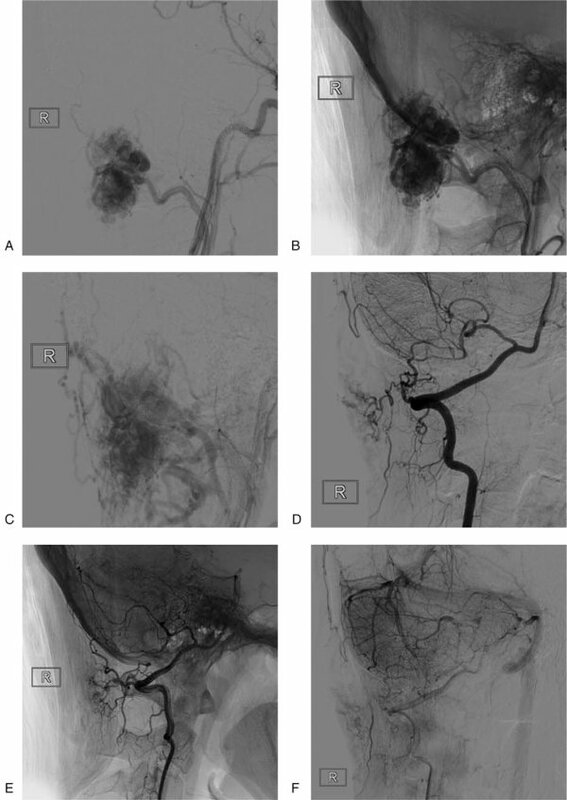 The lesion was considered an AVM based on its imaging characteristics and was recommended for surgical removal. The surgery was carried out under general anesthesia. The lesion could be touched when the occipital skin was incised during the operation. The lesion showed a clear boundary. The occipital artery touched the anterior margin of the lesion, was exposed and ligated, and was removed around the lesion. The lesion consisted of massive blood vessels, and the surrounding muscles were swollen, indicating IH. After the lesion was removed, the normal muscle tissue around the lesion was also removed. The specimen was sent to pathology, and postoperative pathology confirmed that the lesion was IH accompanied by thrombolytic recanalization. HE staining showed that the lesion almost purely consisted of capillaries with only rare cavernous components among the muscles. CD31 staining was positive in the vessel endothelium, indicating that the lesion was an IH. The patient achieved a good recovery after surgery and was discharged from the hospital. A head CTA review performed one year later showed partial residual IH. 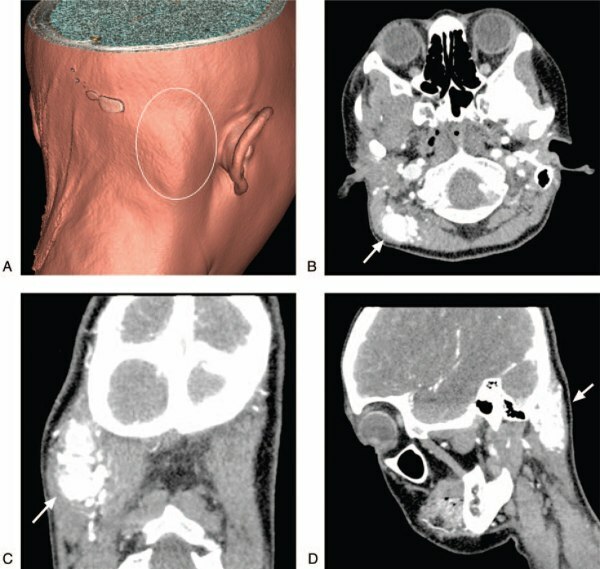 The patient had no obvious discomfort, and the hemangioma could not be touched from the surface, and the patient was recommended for radiation therapy. The patient refused radiation therapy. Follow-up 2 years later showed no enlargement of the IH.